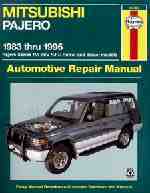 We now have the Haynes Automotive Repair Manuals for the Mitsubishi Pajero in stock. This manual covers all models, '83 to '96, (series NA to NJ), petrol and diesel. The latest edition has been revised and updated, and there's no change to the price! This is not the same as the owner's handbook, which gives a comprehensive guide to the car and its use, however, the purpose of this manual is to help you to get the best value from your vehicle. It can do so in several ways. It can help you decide what work must be done, even if you choose to have it done by a dealer service department or workshop; it provides information and procedures for routine maintenance and servicing and it offers diagnostic and repair procedures to follow when trouble occurs.